Mary Ruth McGinn's class at Stedwick Elementary School in suburban Maryland has an intriguing second name and unique purpose. McGinn's nineteen third graders have formed an in-house troupe called the Fire Starters Kids Opera Company, and they've spent the past eight months writing, composing, producing, and rehearsing an original opera that opens next week. Yet while their new production, A Storm Inside, will display the children's music and lyrics, singing and acting, and costumes and sets, the performance is not the company's main purpose. For these students, creating an opera is a vehicle for learning everything that all third graders must learn, though the process requires a deeper level of introspection and self-expression than is typically found in U.S. classrooms where standardized testing has become the chief measure of success. "People are confused when they hear 'opera' because they think it's an arts program," explains McGinn, who also serves as company director, "but the opera project is total integration." It starts the first day of school because everything we do academically informs the opera process, just as the opera process informs the curriculum. For instance, the kids have an authentic context through which they can apply math and science to build the sets and footlights from scratch, whereas in a traditional format math and science and other subjects are taught in isolation. I meet McGinn in her airy classroom in Montgomery Village, a suburb of Washington, D.C. She's taught all day and supervised a hectic one-hour rehearsal, but she's running on palpable enthusiasm. This dynamic educator, who hails from North Carolina and is now directing her eighth production, trained for her present role at the Metropolitan Opera Guild in 2001, 2002, and 2003, completing three levels of its Creating Original Opera program. Developed in the 1970s by arts consultant, Bruce Taylor, the Met's innovative how-to program has been embraced by hundreds of teachers across the U.S., but McGinn now partners with the Washington National Opera at the Kennedy Center where her students recently enjoyed a backstage tour. The nineteen members of the Fire Starters Kids Opera Company. "The Met's initial training was to help kids create all the aspects of an opera," McGinn says, "but I wanted to find a way to reach all of my kids at New Hampshire Estates in Silver Spring, Maryland, where I was about to launch my first production in 2001." The process always starts with a theme, which is the focus that brings everything else together; it's the central message that the kids want to share with the audience. Well, that September we were barely underway when 9-11 happened, and the theme wound up being dependence -- meaning, how we depend on people and how people depend on us. Her class this year chose the theme of longing, and their thesis became Longing leads us on a path of choices. "The students were having conversations about things they were missing from their lives," McGinn observes, "and we decided that how we respond to longing is what's important. Many educators shy away from the social-emotional aspects of learning. But if we want to build relationships with kids and their families, we have to know who they are, and when they talk about what's important to them, strong feelings do come out." Earlier in Stedwick's All-Purpose Room, the opera company's PR officers, Samson Asmamaw and Akosua Dapaah, described how their theme and plotline evolved. "What happened," Samson said, "is that Ms. McGinn asked us to bring in something special that someone gave them. It was an emotional day because they brought something from someone who passed away or someone who moved away." After exploring the idea of longing, the company developed a story about a sister and brother who discover they have a secret sibling, and when they set the action at a campground they decided to do research. "We went on a field trip to Little Bennett Camp Ground," said Akosua, "because some of us had never been to one before." Many third graders might not understand the importance of publicity, but Samson and Akosua take their responsibilities seriously. They wrote a press release and called reporters (including me) to set up interviews for features. Last fall they and their classmates had to apply for specific company jobs, filling out applications to become a composer, script writer, production manager, costume-makeup designer, set designer, electrician, or performer. "There are only five onstage roles this year," McGinn points out, "so it's not about performing. Every person in the class realizes that without his or her job, the show couldn't happen. The interdependence of it all is one of the vital things they're learning about." If you mention music composition to adults, they say, 'I can't do that.' But sure you can! With the class, we do a lot with emotion and what it sounds like, musically. Usually what they write first is the theme song. They think about what mood they want to convey, and then they write melody, and they record everything. We don't write out the actual notes; it's invented notation -- and somehow it works. The children also play the music during the performance itself. Creating Opera is part of Stedwick's third grade curriculum, but McGinn depends on contributions for enhancements. "This year I received two grants," she says. That's how I got an electric keyboard and several xylophones. I also received a thousand dollars in private donations. I set aside money for field trips -- this year we also got a Target grant -- but I'd be doing very different things if I had more funding, such as hiring visiting artists to work with my students. When I chat with Stedwick's principal, Dr. Margaret Pastor, she can't say enough good things about McGinn's innovative approach. "It's a way to address the whole child," she says. Working as members of the opera company helps children with problem-solving skills because they apply what they've learned, and it also gives them life skills. I was lucky to get Ms. McGinn, and our school now has a model that other teachers can adapt for different subjects. In fact, our fifth graders are doing a 'Mars Project' over several months this year, using similar techniques. For her part, McGinn feels grateful for her principal's vision. "In this atmosphere of constant testing, it's hard to get support for a program like ours, but Dr. Pastor is trying to break that mold. She's amazing -- and courageous." McGinn has seen so many educational benefits from Creating Original Opera, she's determined to spread the word. In 2006 she won a Fulbright Scholarship, took a sabbatical from public school teaching, and spent the next two years in Madrid where she founded La Opera: un Vehiculo de Aprendizaje (LOVA), which means Opera as a Vehicle for Learning. This summer she's heading back to train her fifth group of teachers. "It originally came about," she remarks, "because I wanted to learn Spanish so I could communicate with the families of my students, and I also wanted to share the opera program." I wondered where I could go to do both, and Spain was the logical choice. Different organizations have funded it over the years, including Madrid's Teatro Real, Fundacio Saludarte, and Friends of the Opera, but due to the financial crisis in Spain, these groups are struggling to help us and we're seeking additional funding. We've had as many as 30 schools doing the program, which requires eight days of non-stop training. Spanish teachers from all regions seem to understand the social-emotional focus, and the emphasis on process over product in learning. It's been a thrill to watch LOVA evolve. On this sunny April afternoon, however, McGinn's attention is intensely focused on her company's last two weeks of rehearsal, and she feels proud of the progress the Fire Starters have made. Her students have blossomed as individuals, the shy kids becoming outgoing, the insecure kids growing confident. "I want the world to see," McGinn concludes, "that this is the type of project that can and will motivate and engage our most reluctant learners to do things they never dreamed possible." To read well, to write expressively, to solve problems creatively, to think profoundly, and to persevere in their work because they have a clear, authentic purpose for learning -- and for being. They realize that they are part of something much bigger than themselves and that their work directly affects every other person in the company. They also realize that they have a unique opportunity to deliver a very powerful message to their audience. Their voices will finally be heard. 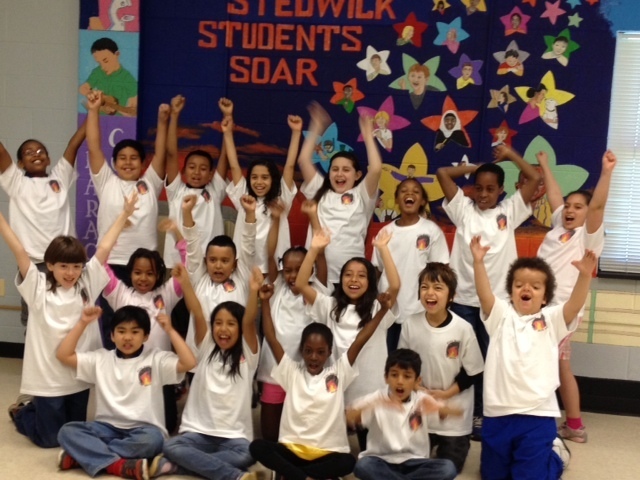 The Fire Starters Kids Opera Company will perform A Storm Inside on May 8 at 2 p.m and May 9 at 2 and 7 p.m. at Stedwick Elementary School, 10631 Stedwick Road, Montgomery Village, Maryland. For information, call 301-840-7187. Admission is free. Tickets are not required. To learn more about Mary Ruth McGinn's work, visit her web site at www.learningforreal.org.